In the movie National Lampoon's Christmas Vacation, Clark W. Griswood hangs 25,000 Christmas lights on his home. 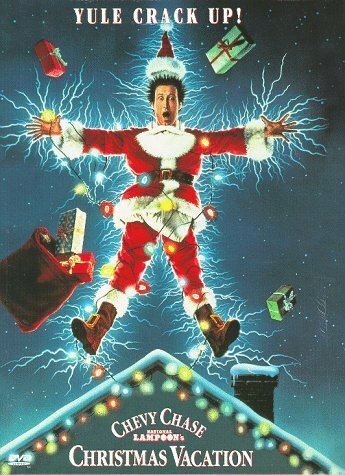 As people who have seen the movie know, when his wife finds the problem of the lights not working (They were plugged into an outlet controlled by a switch); the lights create a blinding display, the electric meter dials spin rapidly, the city street lights dim from the massive current draw, and even someone at the power station throws a switch to generate more electricity. Sounds too good to be true right? Well, maybe it is not too far from reality. Assuming Clark is using the old fashioned C9 bulbs which draw about 10 watts each; his entire display will consume 250,000 watts. That's 1/4 of a Megawatt! Researchers say that power use increases dramatically during holiday times when everyone is using Christmas lights or other electrically operated decorations. I live in California and because of Enron, our electricity is so expensive that many of my neighbors decided not put up Christmas lights anymore. Except for me, during the power crises back in 2000-2001; I happened to come across this. These lights happen to use Light Emitting Diodes (LEDs) instead of incandescent lamps. They run bright but cool and won't burn out as often as incandescent Christmas lights. Also, the set of 100 lights shown uses only 5 watts of my expensive electricity. I first found these at a Savon (now CVS) drug store in 2001. A set of 100 was used on the tree and another 2 sets of 100 outside. They are not as bright when compared to incandescent lamps but as it says on the box, they will last for more than 200,000 hours* (see note at bottom) and run cooler than incandescent lights. Cool running is not critical for me but if you are getting a real tree rather than just an artificial one, this is good because there is less concern of heat buildup or fire risks. You use these lights like regular incandescent mini lights. They have the same fused "Christmas Light" plug and the "End to End" plug feature just like normal mini Christmas Lights so you can plug more sets into the end of the first without going back to the outlet. I used them during Christmas of 2001 and 2002 but never got pictures of them. I tried to photograph them for 2003 but the disposable camera I used was extremely low quality. Anyway, as I had mentioned earlier, they are not very bright compared to ordinary lights but the special shape of the LEDs cast nice patterns on the wall. For the colors, they first had Red, Yellow and Green but now, they have sets in Blue and White LEDs as well. They tangle up in storage just as ordinary strings. Christmas lights that Never burn out ? *It may be more than that. The company that makes these lights says the LED's life is not measured to the point where the LED burns out because it takes too long to do that. Instead, the LEDs are measured to a point where they loose a certain percentage of the original brightness. Because of this, LED Christmas lights may still continue to operate even well past the rate life of ~20 years. Since Christmas lights are only used part of a year, the life of the LED Christmas lights can easily exceed that and my guess is that they may last more than 80 years. Maybe some day many years from now, my great grand children will be using these lights for Christmas. The sets I first bought in 2000 and 2001 were the first generation design which looked as if someone had stuck LEDs into a normal set of mini lights. Current generation sets are noticeably brighter with different lamp styles including C9, C7, mini globe, and the traditional "point" type bulb with either white wire or icicle type cords. People have been asking me where to get these lights so here is a list of stores in my area carrying them this year. LED Christmas lights are not really a new item. Christmas lights using LEDs have existed for a long time but those use a transformer that plugs into the wall. The other brands of LED Christmas lights I know of are the Highlight Brand, Leotek, Noma, Christmas Lights Ect, and Simply Lighting. I haven't found a store that carry these but they are available for order on the Internet. Most use a transformer which either plugs in or is located on the cord. 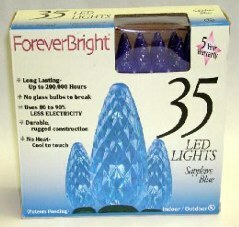 Forever Bright says that they are the first to use a special technology to allow the LEDs to operate directly off of AC. Given that you are plugging these 2.5 volt DC LEDs into the 120 volt AC line with no voltage reduction or rectifiers, you'll be wondering why the set works without the LEDs getting "electrocuted". I have examined the lights and no, they don't use resistors** in the sockets or the LEDs and the electrical cord is not resistive. The plug is just an ordinary "Christmas light" plug with the fuses in it. There is nothing else special about the plug. Finally I got my answer when I removed one of the Led "bulbs" from the string and found out half the string went dark. Just like the normal incandescent "mini lights" the LEDs are wired in series with 50 LEDs in each circuit. If you multiply the forward voltage of the LEDs (2.5 volts) by 50, you'll get 125. Although 125 volts sounds high for household voltage, the normal 110-120 volts AC is enough to light the circuit without "electrocuting" the LEDs. Each LED regulates the others in the set and act as rectifiers for the DC that the LEDs use. Simpler technology and more efficient at converting the power than a regular transformer. We don't need any rectifier diodes, the LEDs are already Diodes themselves. 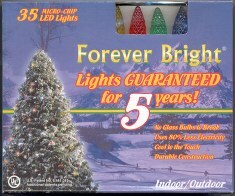 ** As of 2002, the Forever Bright Christmas lights have changed to a new type of LED which are brighter and requires a different amount of current than the original Forever Brights. The new Forever Brights now have resistors in some of the sockets. The LEDs are still wired in series but light strings made 2003 and after have the LEDs permanently attached instead of replaceable. My local stores have began stocking Christmas decorations since the middle of October. The Forever Bright sets are back at Lowe's hardware again with multi-colored, plain red, plain green, blue, white, and a new color-changing set available for purchase. Target has their Philips branded sets available in multi-colored, blue, and white in both normal strings, icicle strings, and rope light style. I looked in Wal*Mart as well and only found multicolored sets; the white and icicle type sets were already gone around the end of October. 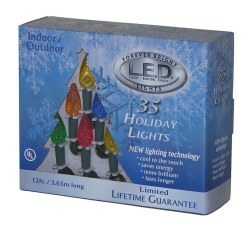 Home Depot has multicolored and blue sets as well as a set that came with an electronic controller to make the lights chase or fade. So far, with more and more stores carrying LED sets, I think they may start becoming more popular this year. 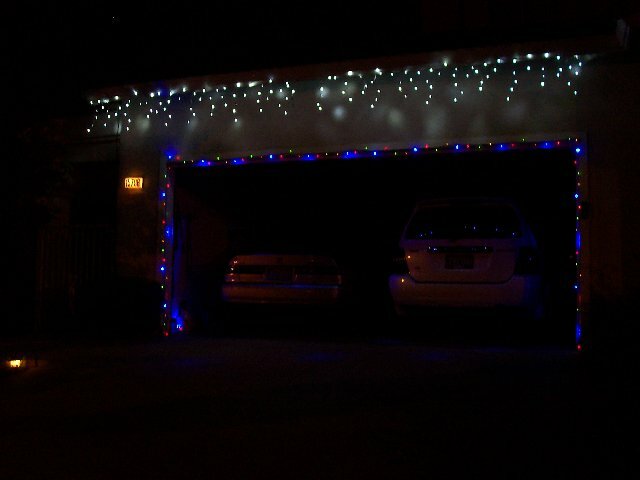 This afternoon, I noticed my neighbor four houses away has a set of lights up around his garage. I usually start decorating the day after Thanksgiving but I may start a little earlier this year as well. Back in September, I also acquired a pair of Crydom Solid State Relays that will be used to control the lights. They will trigger with voltages as low as three volts so I'll be connecting them to an audio source to cause the lights to flash to music. 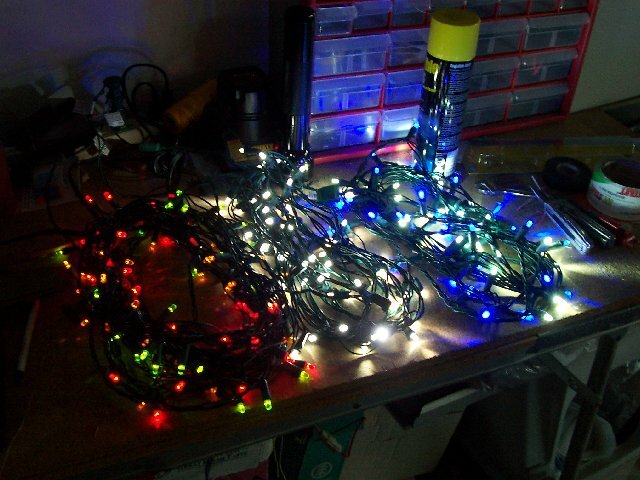 I've also experimented with a 70 volt audio transformer and a few sets of LED Christmas lights as well and the transformer will drive the LEDs on medium volumes with the brightness changing with the music. I am currently deciding what songs I should play to flash the lights. Today, I went to Target to pick up two sets of Philips LED Christmas lights in blue and white. I compared the current generation white set with the white ones I had from last Christmas and I can easily say that the sets for this year are almost twice as bright as last year's. Anyway, I took the blue set apart to see if I could make my own. 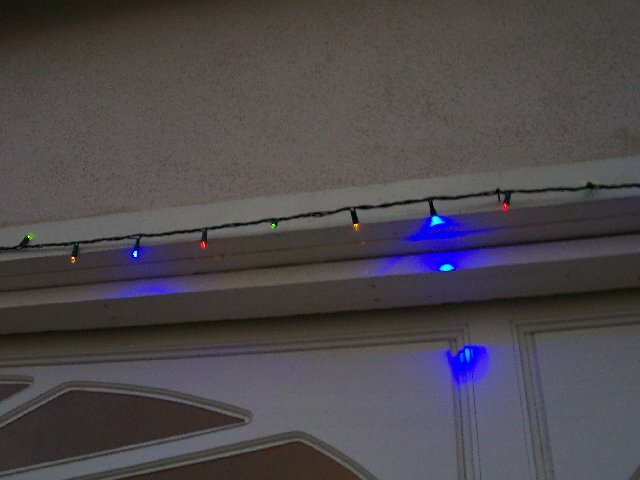 25 LED from the blue set went into one of my 2001 Forever Bright red, yellow, and green set to make a red, yellow, green, and blue set which I hung around the garage. The rest of the LEDs from the blue set were combined with LEDs from the white set to make a custom white and blue set. From my testing, the white and blue colors have a very distinctive look to it. Here's a picture I took while testing my lights. On the left is the 2001 Forever Bright in red, yellow, and green. The set in the middle is a white Philips set from last year. Finally the set on the right is my custom white and blue Philips set. the other LEDs that originally came with this set. I went and hung these up around my garage door. First two sets of lights up and connected to timer.